How do hundreds of different types of cells all develop from the same genome? This is the question driving the emerging science of epigenetics. Here’s what you need to know. This month marks the ten-year anniversary of the sequencing of the human genome, that noble achievement underpinning the less noble sales of 23andMe‘s direct-to-consumer genetic tests. To commemorate the scientific occasion, we’ve created an illustrated introduction to one subfield of genetics likely to produce even more dubious novelty science projects someday: epigenetics. What is epigenetics? Human life begins as a single cell equipped with all of the genetic information—known as the genome—it will need to develop into a full-grown adult. Through a process of repeated cell division, this cell eventually multiplies into tens of trillions of cells, each containing a complete copy of the genome. Despite having identical genetic information, these trillions of cells somehow develop into hundreds of different cell types—from brain to liver cells—that make up the human body (FIGURE 1). Figuring out how one genome can produce so many different types of cells is, in a nutshell, the project of a subfield of genetics known as epigentics. FIGURE 1: Through a process called mitosis, a single cell (A) splits into two cells (B) with identical genetic information. The process continues producing many stem cells (C) each capable of developing into a number of different cell types—in this case a white blood cell (D) and a neuron (E). The epigenome determines what type of cell a stem cell will become.The basic idea: Consider an organism’s genome to be a sort of how-to manual that contains instructions for every possible task required for a complex living creature to survive. Each cell in the body has a copy of the book. However, a brain cell might want to use the chapter on synapses, whereas a blood cell might use the chapter on fighting infections. The epigenome—a group of molecules that package the genome—tells each cell which part of the manual to read. Molecular “caps” called methyl groups can be attached to genes in order to effectively block them from giving instructions to the cell (FIGURE 3). 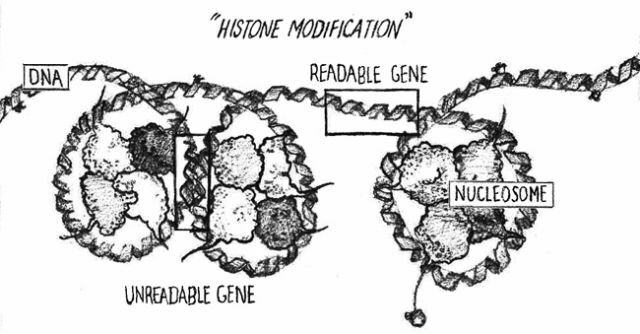 The spool-like histones can coil the DNA so tightly that certain genes become unreadable to the cells (FIGURE 4). 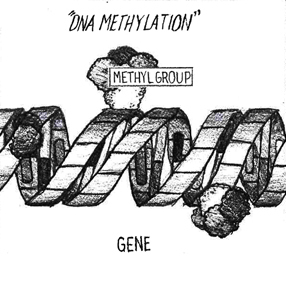 FIGURE 3: Methyl groups attach themselves to base pairs of a gene, changing the way the gene is expressed.In these two ways the epigenome controls which genes ultimately get expressed. Cells perform different functions not because they have different genomes, but because they have different patterns of methyl groups and histones controlling which genes are expressed. Thus, the DNA in each type of cell is identical—its epigenetic counterpart is not. Where do the different epigenomes come from? Think for a moment about the idea that every type of cell has an identical genome and yet a different epigenome and an apparent paradox crops up: How can different types of epigenomes develop from the same genome? The genome encodes a basic structure for the epigenome. This basic structure is more-or-less identical in each cell. That initial framework is then molded into a unique epigenome by signals coming from other cells in the body. Where a particular cell’s epigenome is located in relation to other cells, then, determines how it will be shaped by cell signaling. This makes intuitive sense, as cells in the developing portion of the body that will become the brain are exposed to similar epigenome-shaping signals. The end result is that those cells have similar epigonomes and thus become similar—if not the same—types of cells. FIGURE 4: When DNA is coiled loosely around histones, nearby genetic information is readable. (Note: As in Figure 2, this is a simplified drawing. 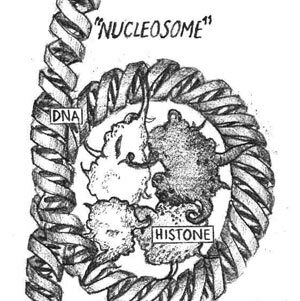 In realitiy, DNA wraps twice around each core group of histones in order to create a nucleosome).Why do scientists care? As the waypoint between our genetic information and our environment, the epigenome is affected by things like food, pollution, toxic chemicals, and stress. And when these factors alter our epigenomes, they consequently alter the way our genes are expressed, which can contribute to the development of cancer and other diseases. Understanding the epigenome may allow us to counteract the changes it undergoes because of environmental factors. Find out more: The above is a basic explainer on epigentics and the function of the epigenome. If you’re still confused about the fundamental concepts, NOVA has a good animation of how epigenetic mechanisms control gene expression (skip to 4:20 in the video). The New York Times also has a well-illustrated article on efforts to map the human epigenome. For a more technical perspective check out the National Institutes of Health’s Epigenomics Program, which offers an overview of the epigenome and some of its potential health implications. The NIH also has a roundup of selected epigenetics studies.